I am obsessed with botanical fragrance. There is something so evocative about it. Scents can change or enhance states of mind. They wrap around you, fill you with moments, and make you feel so alive. Discovering them can be exhilarating. This is yet another reason why I love plants. There are so many with amazing fragrances and many have yet to be experienced! I have a new one for you to check out. Strophanthus gratus also commonly referred to as Climbing Oleander or Rose Allamanda. 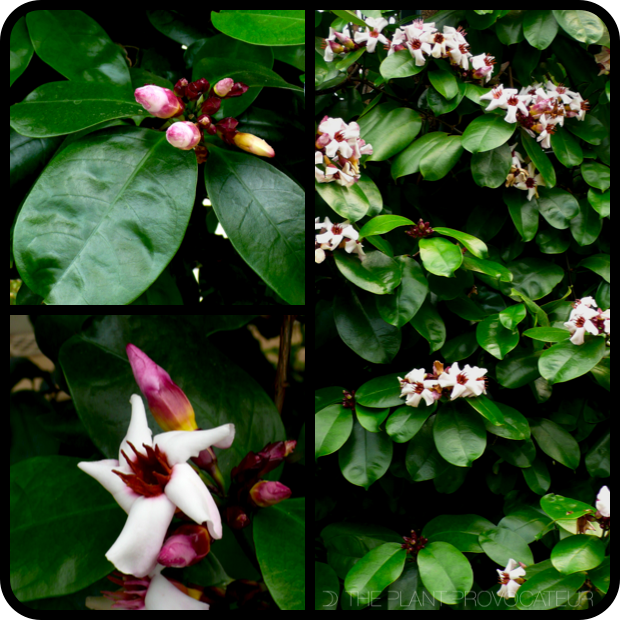 I recently encountered this semi-deciduous, semi-climbing shrub/vine and was enthralled by its tropical beauty! Strophanthus gratus comes to us from western and central Africa. Its 2 inch white flowers are blushed in pink wearing colorful coronas that remind me of crowns. Flowers produce a seductively tropical rose-like scent. Softly mysterious yet romantic. Strophanthus gratus grow with an upright, sprawling branching habit that needs some support in order to climb. Stems outfit themselves with richly colored, luscious leathery elliptical leaves of forest green. Grown and supported as a vine the form of Strophanthus gratus is super lux. As spring growth settles in, buds form for late spring/early summer bloom. The look is jungle-like sophistication and the floral scent is soothing. Love, love, love it! Strophanthus gratus likes full to part sun situations, fertile, well-draining soil, consistent, regular moisture during growing season, and is hardy down to around 28 degrees fahrenheit/-2 degrees celsius. One other thing to note about Strophanthus gratus is that most parts of it are toxic. However, there are parts that are used pharmaceutically as a blood pressure medication and heart stimulant. In contrast, in its native african habitat, its extremely toxic seeds are used as arrow poisons and leaf extracts are used in folk medicine to delay the clotting of blood resulting from snakebites. With that said, use good judgement when deciding to plant a climbing shrub like this. Respect the plant. In return it will respect you with tropical beauty and exotic fragrance.